Augsburg was a must visit since we moved to Germany because it’s where my aunt and uncle were born when my family was stationed near Ulm after the war. 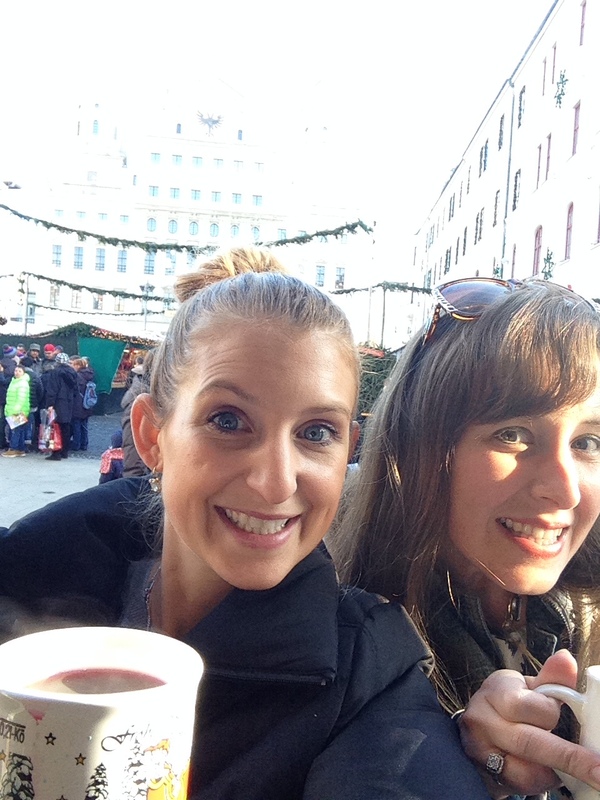 The Augsburg “Christkindlesmarkt” or Christmas market, is also turned out to be one of my top favorites of the year. 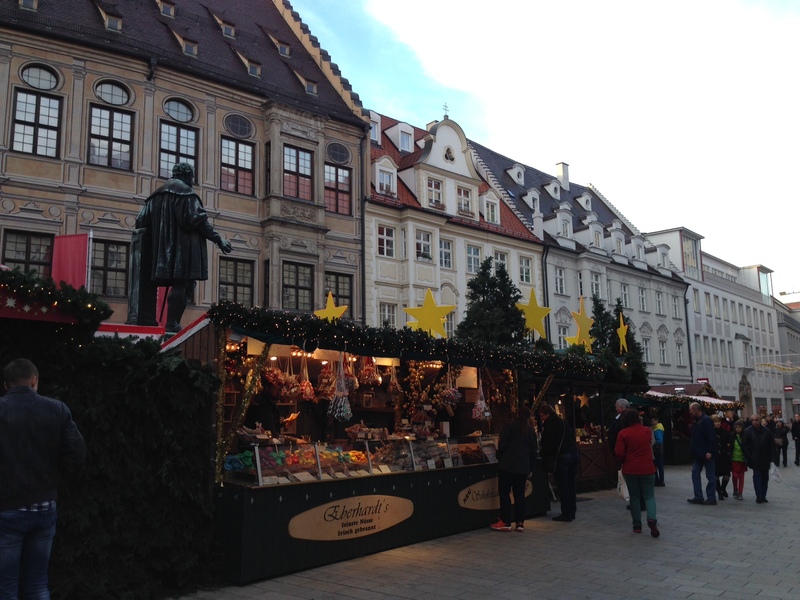 A stop at the very crowded Ulm Christmas Market, on a Saturday in Dec. 2015. Driving from Stuttgart, it takes about two hours. There is also a main train station there in the center too, but since I had a good friend to join in for the day, driving was the better, most unrestricted option. 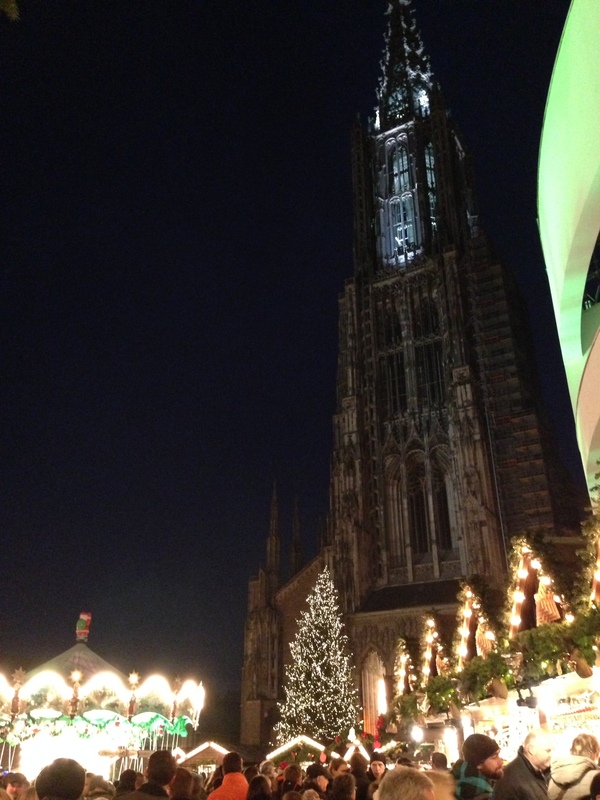 We of course had to detour on the way home to visit the Christmas market in Ulm too. I love Ulm. We went to the christmas market last year during the day, and what a difference going in the evening on a weekend makes – It was completely packed! It was pretty hard to walk through it was so crowded, so we grabbed some Gluhwein, hopped into the Ulmer Munster Church and headed out. We also stopped for dinner at a new burger place before calling it a night, called Tripple B in Stuttgart. This is a big deal because Germany doesn’t really do burgers. Downside: absolutely no parking – it took a half hour at least to find a space by the place, but it was delicious. Breakfast -egg sandwich truck is specifically on my wish list. Fish/chips – a chippy – I think is what a friend of ours called it? 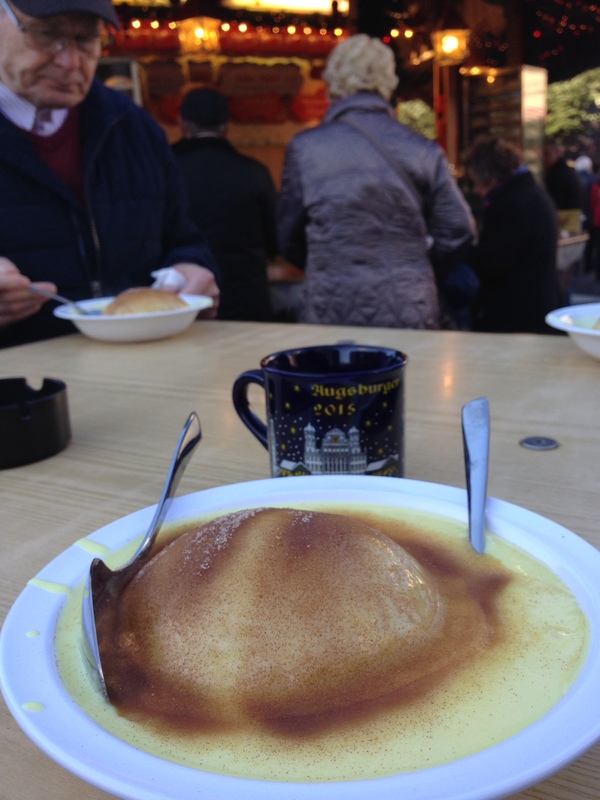 Back to Augsburg, I shared my first Dampfnudel, is a soft bread bun-like thing that can be sweet or savory eaten as a meal or dessert, served in a bowl with a plum/raisin-tasting filling, then a milky sauce is poured over it. The topping choices to then sprinkle on were cinnamon or black poppy seeds. Opting for cinnamon, it was not as sweet as I thought it would be, and it is definitely something to share as they are really large and super filling. Click here for a Dampfnudel recipe. There is a lot of good shopping there in addition to the holiday market too. So good in fact that we made a mid-day trip back to the car to drop off goods and return to the shops. The Glühwein there was also different. It was the first time tasting the popular Franconian version, Heidelbeer-Glühwein (blueberry mulled wine) made from blueberry wine. Delish! square where there are pop-up restaurants outside of the food shops and an indoor specialty food market hall, Stadtmarkt Augsburg. We had lunch at the homemade pasta shop which was located across from one of the fish markets. We watched one of the huge fish repeatedly jump super far out of the tank onto the street into the crowds of people, and the workers scramble to catch it. 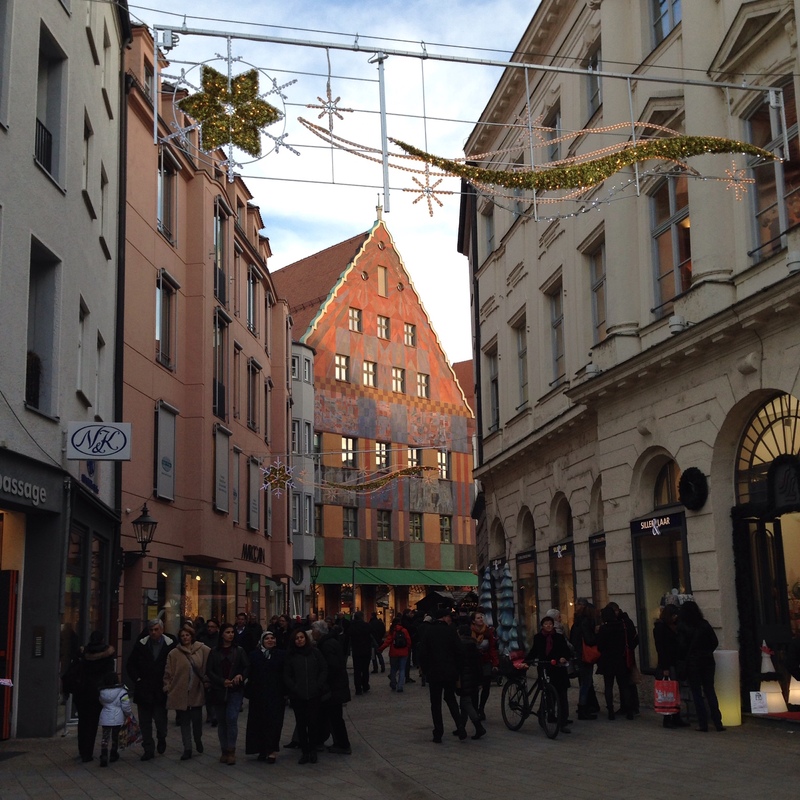 Love the city, the international and local foods, and shopping in Augsburg’s small city center. Next trip, we will have to do some of the actual history stuff like the churches, the old living quarters (Fuggerei) and the tower overlooking the city. Top 10 TripAdvisor list is next when we return. Stay tuned.